Safe high altitude hiking doesn't just happen. It's a result of planning, conditioning, staying alert, and making smart decisions. Let's take those one at a time, so you'll have a plan for how to prepare for a high altitude hike. Note: For the sake of discussion, let's define a high altitude hike as anything over 7500 feet. If you're coming from sea level, though, it could be as low as 6,000 feet. Individual physiology will dictate how well (or not) you handle elevation gain within a short period of time. Every hike at high altitude for you is different from the one before it. You can never predict exactly how your body is going to handle decreased oxygen levels (hypoxia). Those who live at high elevation already, and those who don't. I'm in the "don't" category, so when I go on hiking trips to areas where the trail head STARTS at 7,000 feet, I know I have to be smart about high altitude hiking. 1. Choose your hiking itinerary carefully. Be moderate with your elevation goals and ramp up from there if all goes well the first few days. 2. Divide the number of days you plan to hike into three groups: easy acclimating walks, moderate elevation gain hikes, and, if you have enough time, hikes with several thousand feet of elevation gain and/or loss. 3. Be meticulous about knowing the elevation gain and loss of each hike you plan to do. And don't neglect to note the elevation at the trail head. Does it fit into your acclimation plans, or is it too aggressive? 4. Give yourself a day or two to acclimate to the trail head elevation by camping there, or staying somewhere nearby. 5. Don't deviate from your plan, just because you feel great. Things can change in a hurry (keep reading for details). 6. A rule that hikers use for sleeping at higher elevations is something along the lines of never sleeping higher than 1500 feet above where they began that morning. That doesn't mean you can't push higher once you set up base camp, just don't sleep any higher. These rules respect the hard work your body is doing for you! You're going to plan time to acclimate at the beginning of your trip, as noted above. But what else can you do to prepare your body for the stress of decreased oxygen availability? Increase your aerobic capacity slowly over several months of a steadily more vigorous training schedule. Pick the activities that you will enjoy, and go hard: swimming, biking, aerobic exercise classes, or running. If you already bike, find some hills. Particularly the uphill hills. If you're a long time swimmer, practice strokes that give you the option of holding your breath for several beats. If you run, head for the hills and work in some long staircases on your way there. When you go for daily training walks and longer weekly hikes (which you should be doing), wear your fully loaded pack. Your goal is to strengthen your heart, making it a more efficient pump to circulate your blood. When you hike at higher altitudes, your lungs can't pull as much oxygen into your bloodstream so you need your heart to be able to distribute the less oxygenated blood efficiently. Don't neglect the hard work of making your heart a better pump, and your lung capacity greater than it was at the beginning of your conditioning. Your payoff: increased cardiovascular health. It's one of the most important and far reaching benefits of hiking. Because you are going to stress your body in order to condition it for more harsh conditions than you normally endure, a visit to your health care provider at the beginning of any vigorous conditioning regime is a great idea. Include some blood work to uncover any potential issues with elevated cholesterol levels, vitamin deficiency, or electrolyte imbalances. 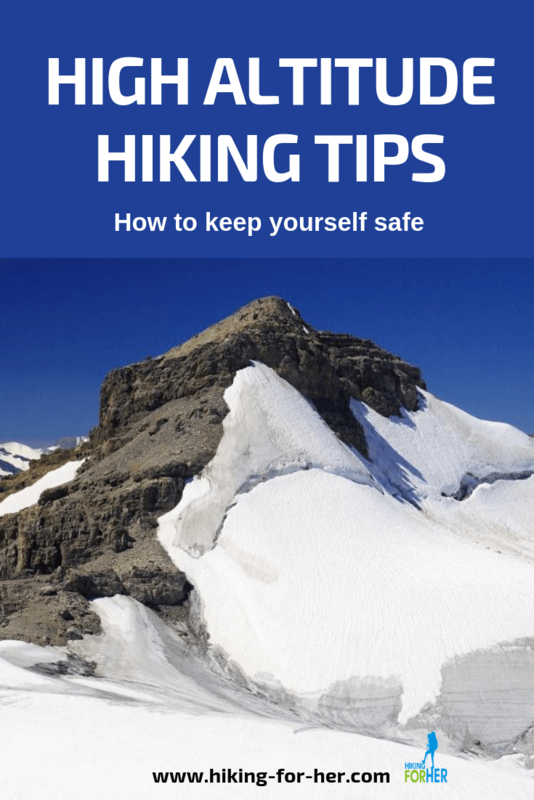 If you have zero experience with hiking at high elevations, you have no baseline on what to expect in high alpine conditions. 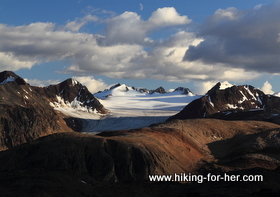 Be conservative on your first high altitude hiking trip, allowing your body to give you feedback about how it feels. From my own experience, you will begin to feel really weird, and you might have other people notice that you're acting weird, too. At the first sign of trouble, turn around and descend slowly. Don't talk yourself out of how you feel. Acknowledge that you're tanking, and turn around. If you have a pre-existing medical condition involving your cardiovascular and/or respiratory system, you need to condition yourself to the fullest extent possible, and get a medical okay before tackling high altitude hiking. There are 3 ways in which your body could react to being placed at a higher elevation than it normally encounters. Each of them carries serious consequences. 1. Acute Mountain Sickness (AMS): Acute means it comes on quickly, and can also be resolved quickly if you spot it and descend. The warning signs mentioned above are associated with AMS. 2. High Altitude Pulmonary Edema (HAPE): The lungs fill with fluid (edema) and impair breathing to the point of coughing and chest pain. This condition can quickly deteriorate into a life threatening situation. That's why it's important to pay attention to small warning signs such as fatigue or shortness of breath that don't go away after resting or eating. 3. High Altitude Cerebral Edema (HACE): "Cerebral" means your brain has noticed that oxygen is in short supply, and the accumulating excess fluid is putting pressure on your precious soft brain tissue. Unconsciousness can occur if HACE continues to build over hours or days. For HAPE and HACE, immediate medical attention is required. Diamox (Acetazolamide) is a medication that can be purchased ahead of time and carried in your first aid kit. Read the directions carefully; you may have to start taking diamox a day or two before your hiking begins. Use your personal locator beacon or satellite messenger to summon help. If you can get down to lower elevation, do that immediately. Don't wait, because with each moment that goes by, more fluid is building and you're risking your health. Remove pride from your itinerary. If you have to turn around without bagging a peak or snapping a photo from the viewpoint, so be it. Even if you're only a short distance from the top. The scenery isn't going anywhere. Next time you can prepare more thoroughly or give yourself more acclimation time. And sometimes you find out that your body just isn't cut out for high altitude hiking. I have seen prime physical specimens twenty years younger than myself succumb to acute mountain sickness. Other times, I've been the one to say "not one more step upward". There is no shame in turning around. And if you're hiking with someone who says otherwise, find yourself a different trail buddy. They don't have your best interests at heart (or brain). To strengthen your chances of hiking safely at high altitudes, be sure you keep yourself well hydrated and snack frequently. Shortness of breath can be compensated for with a slow but steady pace and deep even breathing, to a certain extent. If you usually hike quickly, be smart enough to adopt a slower pace. Train yourself to kick into the mountain climber's pace of resting each non-weight bearing leg briefly as you climb upward. Keep track of your altitude gain, either by using an altimeter or by consulting your topographical map. For every 1000 feet of elevation gain, stop and rest. Check in with yourself before moving upward. Really listen to the little niggly doubts or hesitations. Eliminate possible explanations for your symptoms. Example: Is your headache because you're squinting into the sun? Are you exhausted because you started the hike with no breakfast? Is the pace too fast for the conditions? Or is it the first symptom(s) of altitude sickness? If you can't explain the way you're feeling with any other rational data, then face the fact that the altitude is messing with you and something needs to change. The higher you hike, the more exposure to ultraviolet radiation you accumulate. Wear UPF sun protective clothing. Choose a high quality, breathable sun hat. Use high quality polarized sunglasses. Apply sunscreen and lip balm to protect exposed skin. And if your route takes you over snow, be even more aggressive about sun protection by taking protective measures to safeguard your skin and eyes. Reapply your sunscreen every few hours, even if you're not sweating it off. Cover up all of the skin that you can. Hiking at high altitude in shorts and a tank top is asking for a burn, regardless of your baseline skin tone. Use eye drops to rehydrate your eyes, thus preventing corneal abrasions. 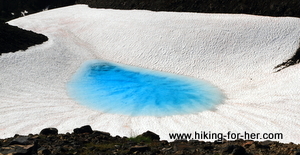 This blue tarn is a pop of color in an otherwise black and white landscape. Keep your eyes safe so you can see it. With every thousand feet of elevation gain, the air temperature drops by at least three degrees. Be sure you've got enough clothing in your backpack to layer on. You want to avoid getting chilled and adding to your altitude issues. You're working hard and may not notice that you need more layers, but your muscles will begin to complain. Include a head and neck covering that can be lashed down tightly, in case the wind picks up. Because it usually does at higher altitudes, and radiating your body heat into space works against you up there. Stay alert to hypothermia signs and symptoms, and take action immediately to reverse them. Fun (?) fact: you don't have to be wet, old or oblivious to succumb to hypothermia. It's a risk we all face at high altitudes. Question, plan, condition, and go! Some of the happiest hours of my life have been earned by slogging uphill to high elevations, such as Camp Muir on Mount Rainier (10,000 feet/3100 meters). And some of my most miserable, queasy hikes have been at altitudes in Yellowstone that don't even come close to Camp Muir. But now you know how to be smart about high altitude hiking.